2015 Brammo Enertia Plus LE. Picture credits - Brammo. Submit more pictures. With a top speed of 65 mph and a range of 80 miles on a single charge, the Enertia Plus LE has the power and handling to operate in the tightest, most sensitive and challenging areas, both indoors and outdoors. 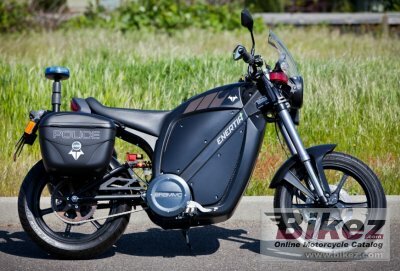 While many of these details require the use of either a mountain bike or a traditional gas powered motorcycle, the Enertia Plus LE can handle them all and at a much lower overall long term cost. Front suspension: Marzocchi Shiver hydraulic USD with compression damping adjustment. Rear suspension: Works Performance hydraulic with pre-load and rebound damping adjustment. Seat: Textured black vinyl and charcoal gray synthetic suede combination with accent stitching. Durable UV and water resistant with added top of seat comfort. Comments: Brammo Power� batteries. Capacity: 6.0 kWh. Voltage: 88.8 V (nominal). Recharge time approximately 8 hours. Battery Life: 500 recharges.850 Watt on-board battery charger, which can charge using any standard 110-120 Volt / 15A electrical outlet (standard US household) or equivalent European household outlet. Under deceleration, energy is returned to the battery system to both extend driving range and provide familiar rider feedback. Ask questions Join the 15 Brammo Enertia Plus LE discussion group or the general Brammo discussion group. Bikez.com has a discussion group for every motorcycle. Here you may find answers to common questions about the model. If you do not find what you are looking for, you can ask questions. Try out the 2015 Brammo Enertia Plus LE discussion forum. You can sign up for e-mail notifications when other users answer you. If you have information about any technical issue related to this motorcycle, please leave a comment for other riders.